Tag Archives for " Delivering Happiness "
29	Are You Delivering Happiness? My guest for today’s episode of the Duct Tape Marketing podcast is Tony Hsieh, CEO of the billion dollar company Zappos. Tony describes Zappos as a service company that happens to sell shoes online. 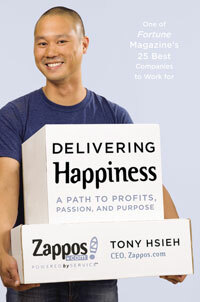 Hsieh cites his research into positive psychology or the science of happiness as one of the factors of success at Zappos. Changing the culture to being about making employees, vendors and customers happy became the Zappos brand. Building processes to deliver happiness at every touch point is hard to do. You have to build it at the core and let the people deliver who you are. Define the core values and make it something that get amplified everyday. Hire and fire based on the core values. My question is when will there be a Zappos Airline?